The creation of the UN system during World War II is a largely unknown or forgotten story among contemporary decision makers, international relations specialists, and policy analysts. "Then," the imaginative and transnational thinking about solutions to post-war problems demonstrated a realization that victory in WW II required an intergovernmental "system" with enough power and competence to work—that is, the UN was not established as a liberal plaything and public relations ploy but rather as a vital necessity for post-war order and prosperity. "Now," which often seems a pale imitation of wartime thinking that nonetheless reflects a growing and widespread recognition of the fundamental disconnect between the nature of trans-boundary problems and current solutions seen as feasible by 193 UN member states. "Next steps," or the collective wisdom about the range of new thinking and new institutions that, in fact, may well have antecedents in wartime thinking and experimentation and could be labelled blue-prints for a "third generation" of intergovernmental organizations. This work will be essential reading for all students and scholars of the United Nations, International Organizations and Global Governance. Dan Plesch is Director of the Centre for International Studies and Diplomacy at SOAS, University of London. His most recent book is America, Hitler and the UN (2011). His follow-on research includes a forthcoming international criminal law article on the UNWCC of 1943-1948. He previously worked for the BBC and CNN, the Royal United Services Institute and was the founding director of the the British American Security Information Council 1986-2000. His other publications include The Beauty Queen's Guide to World Peace, A Case to Answer (2004) and Preparing for the First Use of Nuclear Weapons (1987). He is co-director of the Wartime History and the Future United Nations Project. Thomas G. Weiss is Presidential Professor of Political Science and Director of the Ralph Bunche Institute for International Studies at The City University of New York’s Graduate Center. He is Past President of the ISA (2009-10). His most recent single-authored books include Global Governance: Why? What? Whither? (2013); Humanitarian Business (2013); What’s Wrong with the United Nations and How to Fix It (2012); and Humanitarian Intervention: Ideas in Action (2012). He is co-editor of the Routledge "Global Institutions Series" and co-director of the Wartime History and the Future United Nations Project and of the Future UN Development System Project. 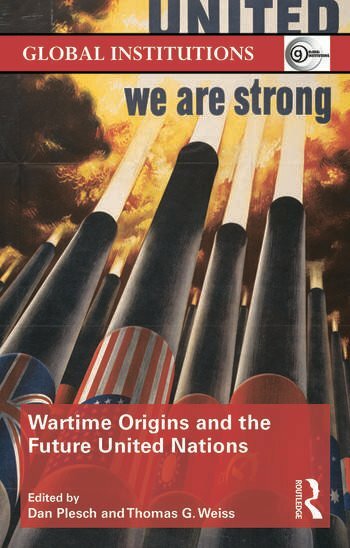 "Wartime Origins and the Future United Nations was published on the 70th anniversary of the April 1945 San Francisco Conference that adopted the Charter of the United Nations. The editors of the book have put together a 'collection of essays for studying and teaching international relations' as they were clearly 'persuaded that a more thorough consideration of wartime history could help inform the study and practice of the future United Nations and of international relations more generally'."